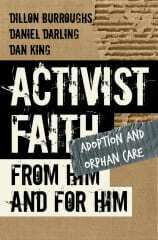 The Activist Faith project has been more than a book project for me. It’s been part of a process of discovering a way of life. The process started in my heart several years ago, and it’s hard to believe that it’s already been a year since the book was released. That doesn’t even include some new publishing projects releasing soon, and a new role in ministry at church where I have more opportunity to raise up and release leaders into exciting ministry opportunities. There’s definitely a lot going on! 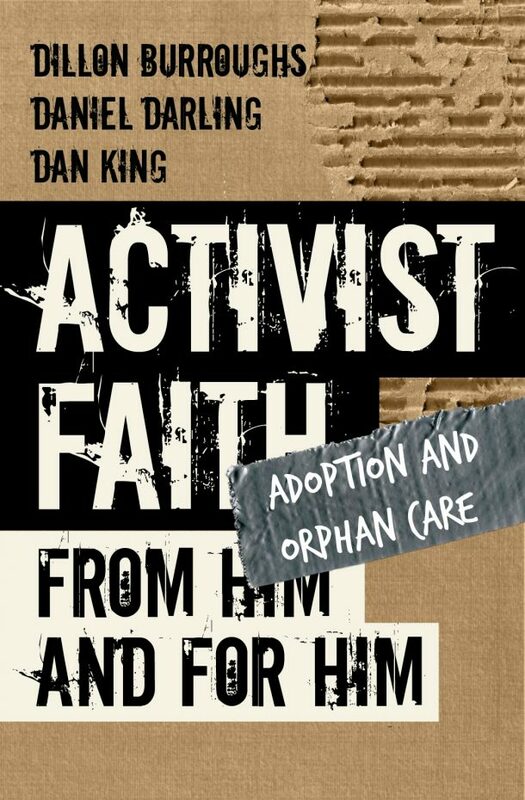 As I look back at the past year since the release of Activist Faith, there are a few things that stand out to me about launching a book project like this one. Most of the feedback I get from people is that they love two things about this book. First is that they appreciate getting an overview and biblical understanding of what the issues are. Knowledge is power, and often it is our lack of knowledge that shuts us up in everyday conversations. Helping people gain understanding of the major issues in society gives them the confidence to talk about them with friends and family. The other thing people appreciate most about the book is the simple action steps they can take to deal with any of the issues we talk about. One of our goals with the book was to equip people not only with knowledge, but also with tools to make a difference. We do this by calling attention to people and organizations who are already doing great work, and highlighting initiatives they have where people can come alongside them to support their work. Other times we simply point out ways we can change our behaviors and habits to make a difference. This is something I learned from doing the book with a small group from my church. Each of the twelve social issues discussed in the book could have volumes written about them. We only gave each a single chapter, so that we could cover twelve topics we believe are critically important. Therefore, each chapter was more like a launching point, rather than the last word on any given discussion. The chapter four discussion covers environmentalism and Creation care. We hit all the big points, complained about recycling, and begrudgingly recognized that we needed to get better at that kind of stuff. While thinking about the things we throw away, one member of the group who installs kitchen cabinets for a living, was sharing about how many unused cabinet doors end up in the dumpster. My wife, who likes to make wall art on wood boards, thought they might be a great “canvas” for her to do some of her artwork on. Within a few days, the cabinet guy delivered a bunch of those cabinet doors (which would have ended in a dumpster) to our house. 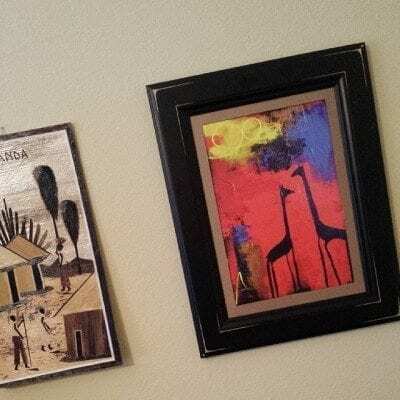 I’ve had my eye on them too, and saw one that was just about the right size to fit a print that Emily Wierenga gave me, when we were in Africa together, of one of her pieces. I used a piece of (trash) cardboard as the mat, and the result is a beautiful, completely recycled frame for Emily’s art (which she is overjoyed about). That’s the kind of stuff that can only happen when Activist Faith is done in community with other people! Those are the conversations that end up making a big difference. One other thing I noticed, and I noticed it mostly through my wife, is that it’s easy to get overwhelmed by the scope of these issues. 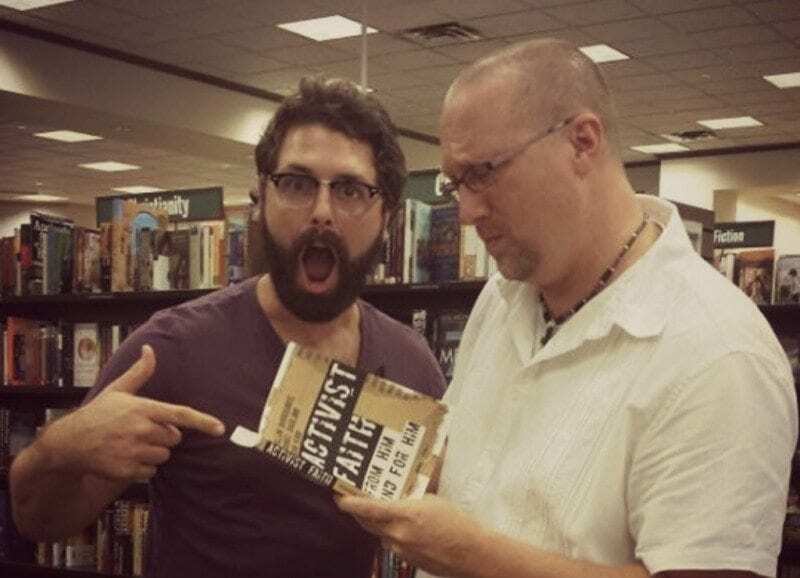 When you learn about how human trafficking is in your own backyard, and that the grocery store you shop at is full of produce farmed by immigrants forced into low-wage labor, and how many kids are in the local foster care system… it can get paralyze you! Many people may end up doing nothing because there are so many things that need to be done, and they just don’t know where to start. The best advice I can give in that situation is to grab on to one thing, even if it’s just a little thing. Start doing that. It will make a difference. Each of us doesn’t have to take all the problems of the world on our own shoulders. But when each of us does what we can, especially the things we’re super passionate about, then all of those little things add up to make a huge difference. Master one thing at a time. Then once it’s become part of your new normal, maybe pick up another thing. Just do what you can manage, but do it well. If you haven’t read the book yet, then get it now! Read it, pray about it, and go find someone to talk to about it. Consider starting a small group in your church using this book. If you do, then let me know. I’ll throw a few things your way that helped us, and maybe I can even Skype into your group sometime! 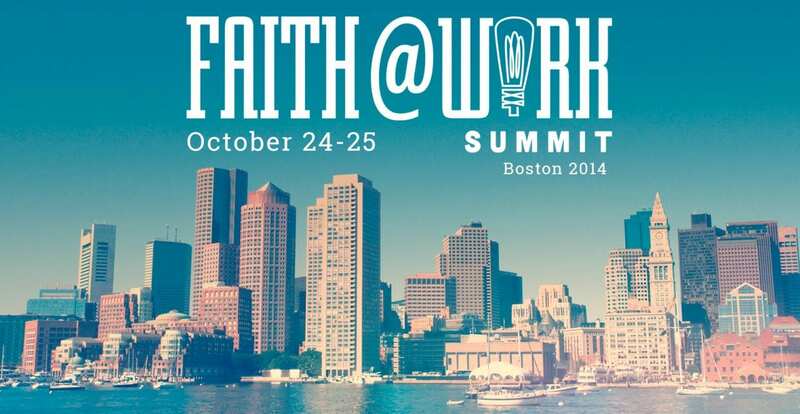 Check out the Activist Faith Google+ community I’ve started. Jump in and share your experiences, links to other helpful resources, and information about organizations who are doing good work in any of the areas we discuss in the book. For me and my family, after this book, we were convicted to do one thing — and that that one thing was very multifaceted and overwhelming — but, God. We had erroneously thought would lead to the next thing. But, it didn’t. And that’s okay. We listened to God, acted out of obedience, and realized, much like you said above, that it can (& is) overwhelming to think one person can do it all. I cannot save the world. I cannot save any single person. But, God can. Obedient duty to live love aloud through actions and words is a privilege – always – because it demonstrates our thankfulness for what He’s done for us. Thanks to you, coach Dude, and the other authors, for this book. You have no idea how much this blesses me, Darlene! It’s exciting for me to know that I’ve been a part of God working in your life. That was my prayer as I wrote my chapters for this book… that God would somehow use what He’s putting on my heart to stir other people to do something. Your story is a perfect example of an answered prayer. Thanks for reaching out, Richard! Unfortunately, I already get more free books than I can handle. give Mike a big #fistbump for me!